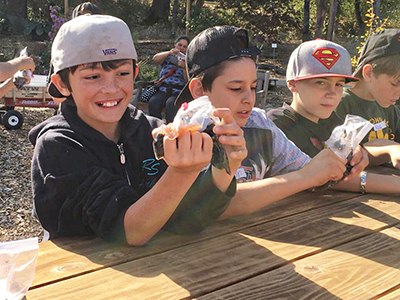 Several dozen fifth and sixth-grade students made the trip from Georgetown to visit the Sherwood Demonstration Garden and Wakamatsu Tea and Silk Colony Farm in Placerville for a day of unique healthy living lessons. At the Demonstration Garden, children learned about native plants, crushed grapes with their hands, and took interesting pictures to express themselves in a PhotoVoice project. The trip was facilitated by teacher, Annie Brown, and Monica Drazba of U.C. Cal Fresh. “It is great for them to gain this type of knowledge outdoors and with their hands. Students have been working on their photo projects and are using tablets to capture images of their ideas on healthy choices,” explained Mrs. Brown. The Sherwood Demonstration Garden was created in 2008 in a partnership between El Dorado County Master Gardeners (through the Regents of the University of California Cooperative Extension) and the El Dorado County Office of Education (EDCOE). Their goal was to build and maintain a public, outdoor learning facility on property owned by EDCOE—a project that would not only beautify a local area but would provide important educational and science-based horticultural programs to residents. This beautiful garden is located next to the Community Observatory at the El Dorado Center of Folsom Lake College. Later that day at the Wakamatsu Tea and Silk Colony, students learned about local culture and history, restoration and maintenance of natural resources, and sustainable agricultural practices. The spectacular 272-acre Placerville farm, at 941 Cold Springs Road, is a fascinating part of El Dorado County history. Listed on the National and State Register of Historic Places, the Wakamatsu Community Farm is a unique part of California’s agricultural legacy. Campaign and Communications Manager, Melissa Lobach, noted, “The American River Conservancy is looking forward to expanding educational programs at the Wakamatsu Community Farm. Learning opportunities on this historical working farm are practically endless." For more information about field trips and programs for learners at Wakamatsu, please contact wakamatsu@ARConservancy.org or 530-621-1224. For more information about the Black Oak Mine Unified School District and Georgetown School.